79. When the diagram of an object is placed with one of its principal systems of horizontal lines parallel to the picture plane, it is said to be in Parallel Perspective. This is illustrated in Fig. 24, by the rectangular block there shown. One system of horizontal lines in the block being parallel to the picture plane, the other system of horizontal lines must be perpendicular to the picture plane. The vanishing point for the latter system will be coincident with SPV (§ 52). The horizontal system that is parallel to the picture plane will have no vanishing point within finite limits (§ 54, with note; also last paragraph of note under § 69). The third system of lines in the object is a vertical one, and will have no vanishing point within finite limits (§ 54). Thus, of the three systems of lines that form the edges of the block, only one will have a vanishing point within finite limits. This fact has led to the term One-Point Perspective, which is often applied to an object in the position shown in Fig. 24. 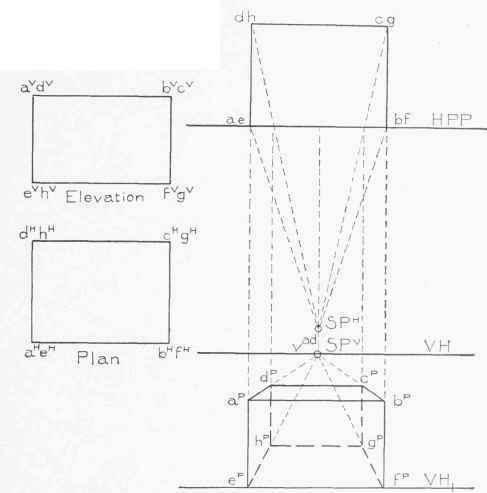 As will be seen, this is only a special case of the problems already studied, and the construction of the perspective of an object in parallel perspective is usually simpler than when the diagram is turned at an angle with HPP. 80. The vertical face (abfe) of the block lies in the picture plane. It will thus show in its true size and shape (§ 24 h). The points ep and fp will be found on VH1 vertically below the points e and f in the diagram. 81. Both the edges epap and f'1bp are lines of measures, and will show the true height of the block, as given by the elevation. 82. The two lines a pbp and cpf p, since they are formed by the intersection of the bases of the block with the picture plane, will also be lines of measures (§ 55), and will show the tine length of the block, as given by the plan and elevation. 83. The perspective of the front face of the block, which is coincident with the picture plane, can be drawn immediately. From ap, bp, ep, and f p, the horizontal edges, which are perpendicular to the picture plane, will vanish at vad (coincident with SPV). The rear vertical edges of the block may be found in the usual manner. 84. The lines ap ,bp dp cp, ep' f p, and h pg p, which form the horizontal edges parallel to the picture plane, will all be drawn parallel to one another (§ 54, note); and since the lines in space which they represent are horizontal, ap bp, dp , ep ep f p and hpgp will all be horizontal (see last paragraph of note under § 69). 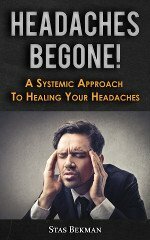 All of the principles that have been stated in connection with the other problems will apply equally well to an object in parallel perspective. 85. Interior views are often shown in parallel perspective. One wall of the interior is usually assumed coincident with the picture plane, and is not shown in the drawing. For illustration, the rectangular block in Fig. 24 may be considered to represent a hollow box, the interior of which is to be shown in perspective. Assume the face (ap bpf pep) that lies in the picture plane to be removed. 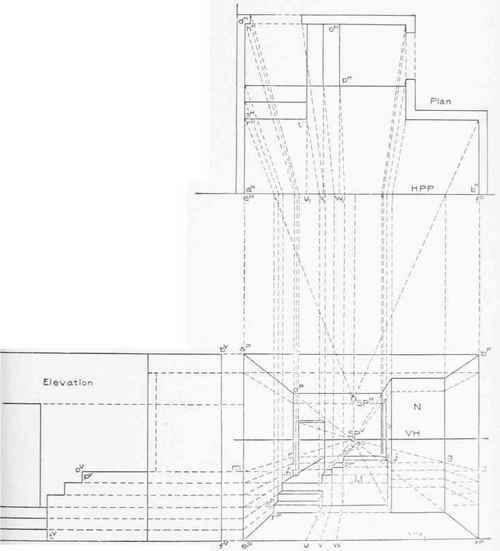 The resulting perspective projection would show the interior of the box. In making a parallel perspective of an interior, however, VH is usually drawn lower than is indicated in Fig. 24, in order to show the inside of the upper face, or ceiling, of the interior. With such an arrangement, three walls, the ceiling, and the floor of the interior, may all be shown in the perspective projection. 86. Fig. 25 shows an example of interior parallel perspective. The plan of the room is shown at the top of the plate. This has been placed so that it may be used for the diagram, and save the necessity of making a separate drawing. The elevation of the room is shown at the left of the plate, and for convenience it has been placed with its lower horizontal edge in line with VHj. In this position all vertical dimensions in the object may be carried by horizontal construction lines directly from the elevation to the vertical line of measures (apep or bpfp) in the perspective projection. 87. The front face of the room (apbpfpep), which is coincident with the picture plane, may first be established. Each point in the perspective of this front face will be found to lie vertically under the corresponding point in plan, and horizontally in line with the corresponding point in elevation. Thus, ap is vertically under aH, and horizontally in line with av. All lines in the room which are perpendicular to the picture plane vanish at vad (coincident with SPV). Drawing visual rays from every point in the diagram, the corresponding points in the perspective projection will be vertically under the points where these visual rays intersect HP P. The construction of the walls of the room should give the student no difficulty. 88. In finding the perspective of the steps, the vertical heights should first be projected by horizontal construction lines from the elevation to the line of measures (apep), as indicated by the divisions between ep and m. These divisions can then be carried along the left hand wall of the room by imaginary horizontal lines vanishing at vad. The perspective of the vertical edge where each step intersects the left hand wall may now be determined from the plan. Thus, the edge sprp of the first step is vertically below the intersection of HPP with a visual ray drawn through the point sH in plan, and is between the two horizontal lines projected from the elevation that show the height of the lower step. The corresponding vertical edge of the second step will be projected from the plan in a similar manner, and will lie between the two horizontal lines projected from the elevation that show the height of the second step, etc. From sp the line which forms the intersection of the wall with the horizontal surface of the first step will vanish to vad, etc. From rp the intersection of the first step with the floor of the room will be a line belonging to the same system as apbp, and will therefore show as a true horizontal line. The point tp may be projected from the diagram by a visual ray, as usual. From t p the vertical edge of the step may be drawn till it intersects a horizontal line through sp, and so on, until the steps that rest against the side wall are determined. 89. The three upper steps in the flight rest against the rear wall. The three upper divisions on the line epm may be carried along the left hand wall of the room, as indicated, till they intersect the rear vertical edge of the wall, represented by the line dPhp. From these intersections the lines may be carried along the rear wall of the room, showing the heights of the three upper steps where they rest against the rear wall. The three upper divisions on the line epm have also been projected across to the line f php, and from this line carried by imaginary horizontal lines along the right hand wall of the room to the plane X, across the plane N to the plane O, and from the plane O to the plane M. Thus, for illustration, the upper division, representing the height of the upper step, has been carried from m to c; from c to g along the light hand face of the wall; from g to j along the plane N; from j to k on the plane O, and from k to pp on the plane M.
The point pp is where the line which represents the height of the upper step meets a vertical dropped from the intersection of HPP with a visual ray through the point ph in the diagram. pp is one corner in the perspective of the upper step, the visible edges of the step being represented by a horizontal line, ppk, a line (pP 0p) vanishing at vad and a vertical line drawn from pp between the two horizontal lines on the plane H, which represent the height of the upper step. The point op is at the intersection of the line drawn through pp, vanishing through vad, with the horizontal line on the rear wall drawn through the point n, and representing the upper step where it rests against the rear wall. The remaining steps may be found in a similar manner. The student should have no difficulty in following out the construction, which is all shown on the plate. 90. The position of the point tp on the line rp tp was determined by projecting in the usual, manner from the diagram. The position of tp might have been found in the following manner: In the figure the line epf p is a line of measures (§ 81), and divisions on this line will show in their true size. Thus, if we imagine a horizontal line to be drawn through t p parallel to the wall of the room, it will intersect epf p in the point u. Since epu is on a line of measures, it will show in its true length. Thus, tp might have been determined by laying off epu equal to the distance ehu1 taken from the plan, and then drawing through the point u a line vanishing at vad. The intersection of this line with the horizontal line drawn through rP will determine tp. In a similar manner the vertical edges of the steps, where they intersect the plane M, might have been found by laying off from u, on epfp, the divisions uv and vw taken from the plan. These divisions could have been carried along the floor by horizontal lines parallel to the sides of the room (vanishing at vad), to the plane M, and then projected vertically upward on the plane M, as indicated in the figure.